Hello! It's slowly creeping up, it's bouncing back into our weekend soon...it's Easter! *pop* As I do each year (although, I've only been around for 2 of them!) Here's a little round up of nifty gifty bits and bobs which don't break the bank/are good value for what they are. All round good'un: Daffodils! Most supermarkets sell daffodils bundles for just £1, or you can get things like little tubs of tete a tetes (the tiny ones) for around £1-2. These may be a good gift for someone who doesn't like chocolate, or just for yourself to brighten up the place. 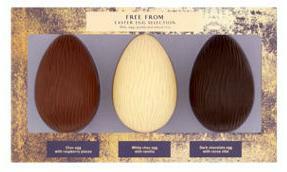 Asda have this lovely looking trio of milky style, white and dark chocolate eggs for £4.50. Looks nice as a gift on it's own, or could be split up. Morrisons also have their own eggs, for £2.50 you can get an egg with truffles, in milky, white or dark. Often Morrisons do a 3 for £10 on Moo Free eggs too. This hasn't happened yet but if it does, I'll update the blog! Sainsbury's have milky and white, but also strawberry and white chocolate. Each are £3.50, so getting a bit expensive, but interesting flavour! They also have 'Rhythm' mini egg bags for £1.25. I think you get 6 mini eggs. Holland and Barrett have their own milk style egg for £2.99, which includes a little chocolate bar. H and B also have Plamil/So Free products, such as these mini half eggs and larger white chocolate egg, both £2.99. Asda also has this bigger bunny for £3! Whatcha think?! Lots to choose from this year, it's always expanding, which is great! Have I missed anything? If so, let me know and I'll add it and credit you! Hello, I think this blog may be short, but too long for a tweet. Jackfruit is a booming business at the moment, with a whole array of products on the shelves. However, with the prepackaged, prefalvoured jackfruit, it can be pretty expensive, but fear not! Most supermarkets now do tins of young jackfruit, the type you need for pulled style foods. Here's a tiny round up of jackfruit tins. Please note! Asian supermarkets tend to have jackfruit, but this isn't possible for many people, so I won't go too much into this. But if you have a store near you, it's worth a check! Asda and Sainsbury's also sell this brand for £1.20. The good enough I guess! Tesco have now released their own brands tins for £2. You get 10g more in the tin, but that doesn't equate to the 80p more. But good to know if Tesco is your only available supermarket. No good me telling you this joyous tip if you don't know what to do with it! Well the truth is, I just Google recipes to try until I find one with easy to find ingredients that are cheap enough in case I muck it up. So I've done this! This recipe from It Doesn't Taste Like Chicken has very normal ingredients and is pretty quick. https://itdoesnttastelikechicken.com/easy-vegan-jackfruit-tacos/ But there are tons of recipes online if you fancy something else. Hello! 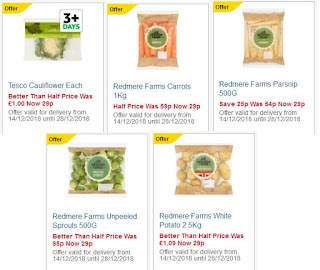 Every year Supermarkets such as Tesco, Aldi and Lidl put an offer on an alliterative number of vegetables over Christmas (festive five, seasonal seven etc). 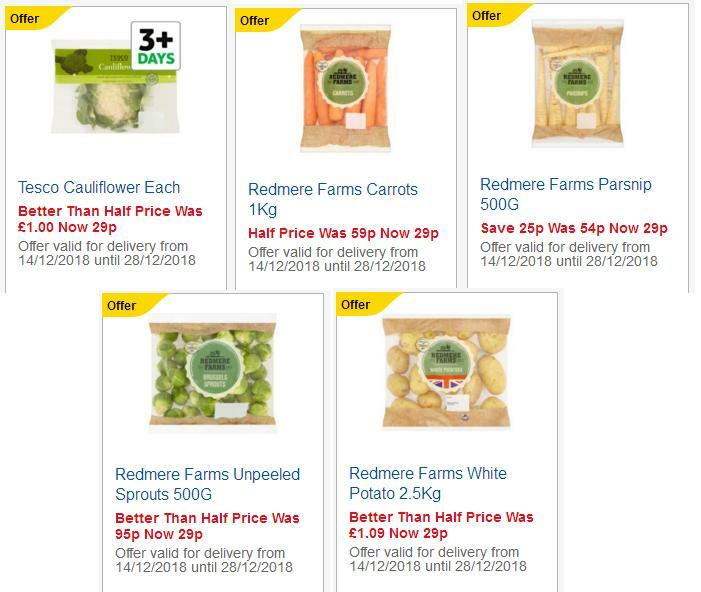 Tesco have announced their 5 veg, which are only 29p a bag until 28th December (so perfect to be fresh from Christmas day!). This feels like a nice, useful mix of veg! If you're using my Christmas dinner guide (here: Christmas dinner) then the prices will differ now for the better! I'll look out to see if other supermarkets have announced their yet! Yesterday I posted about Tesco now marking their toiletries if they're vegan (rejoice!) Well now I have a couple of pics to show what to look out for, plus info on their fixed cut off date for animal testing! And I have a couple of bath products too, which I believe were about 70/80p each. Do share if you find any of their other products newly labelled! Hello! So Halloween is coming around and I thought you may like some little vegan treat tips! Here's just a few sweet ideas which don't break the bank! Or Tesco do a range of their own sweets, lots of which are vegan, 3 for £1 such as these Fizzy belts, strawberry lances and flying saucers. Just double check they're marked vegetarian and check for things such as beeswax (usually used if not fizzy). Toffee apples: I get confused if these are for Halloween or Bonfire Night, so here's a recipe if you fancy making your own: TOFFEE APPLE RECIPE or if you buy them, Tesco have vegan ones for £1 or 2 for £1.50 TESCO TOFFEE APPLE. Chocolate apples: Usually out the same time as toffee apples, chocolate apples are pretty popular! However not usually vegan in shops (boo!) so it might be fun if you want to make your own! Just melt your favourite vegan chocolate, stick a skewer in your apple, cover your apple in chocolate and whilst still melty, add toppings you like such as vegan mallows! 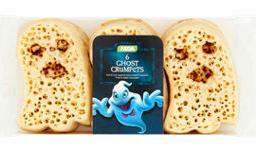 Asda have released crumpets for just £1 for either 6 ghosts, or 6 pumpkins (they're just round with the brown bits cleverly placed, but for a pound I'm not complaining!). I love them! Having a dress up where you need liquid latex for your look (for 'cuts and wounds' usually!) Revolution Pro have a vegan liquid latex for £2, also available at Superdrug! I believe casein is often used in this, which is why a vegan one can be hard to find! LIQUID LATEX. They also have FAKE BLOOD which they categorise as vegan. It seems you can get a small pumpkin from about 75p this year. Some ideas of what to do (as well as carve it!) include toasting the pumpkin seeds/use them how you may choose to use raw seeds. You shouldn't eat the pumpkins you carve, however they are compostable and I'm sure animals would love them left out after Halloween has been and gone! Have a spooky day! Hope this helps! Hello! 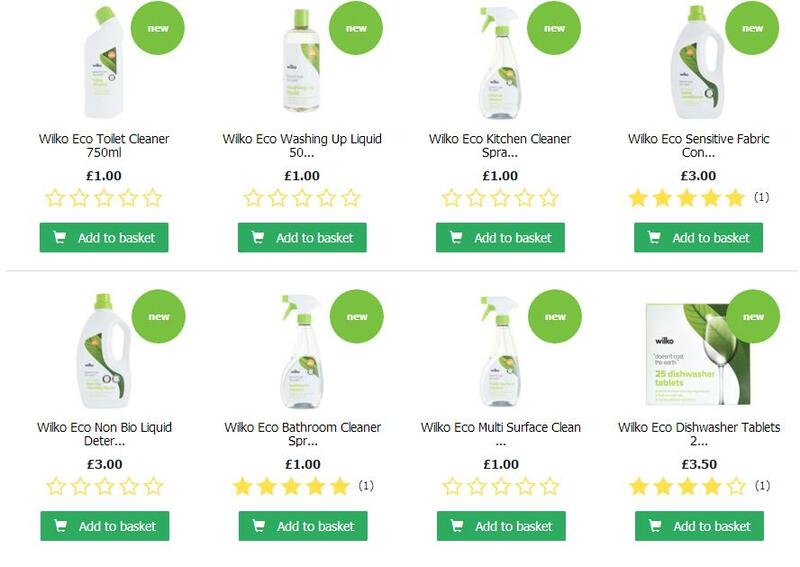 It seems to be a bit of a trend at the moment that shops are releasing own brand Eco cleaning ranges (a trend I am very happy with!) with Wilko being the latest! 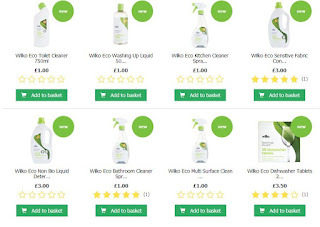 The prices of this new range seem pretty good though, with things like washing up liquid and cleaning sprays at £1 and 1.5L fabric detergents and conditioners for £3 (and more)! The range proudly states that it is vegan friendly, as well as non-harmful to aquatic life. The bottles are also 50% recycled materials, being 100% recyclable themselves. Hello! Sorry it's been a while since I've written a proper blog post, but I'm back! Well, I've had a good idea for one! I was in Asda and noticed a 'new' own brand oat milk. So it got me thinking, where are the cheapest plant milks?! Well, hopefully this blog will answer it, and maybe a bit more. I'll be comparing the 4 main supermarkets of Tesco, Sainsburys, Morrisons and Asda, looking at soya, oat, almond, rice and coconut milk (plus some notable mentions). Tiny disclaimer in bold: I have not tried all the milks I'm suggesting. If there is vitamin D in the milk, I have done my best to check it is from vegan sources. Let's get to business! Others to note: Morrisons do a sweetened and unsweetened longlife for 60p each. Others to note: Alpro frequently have offers on oat milk, for example, when I made this post, Morrisons, Sainsburys and Tesco had Alpro longlife oat milk for £1. Cheapest I've found: Sainsburys longlife (both sweetened and unsweetened) at £1 permanently. Others to note: Alpro is again often on offer, with Tesco selling the Alpro roasted almond longlife milk for £1 as I type this! Cheapest I've found: There appears to surprisingly be no 'cheap' rice milk. However as I type this, Rice Dream is on offer for £1 in Morrisons and Alpro is £3 for 3 there too. Others to note: Tesco currently have Alpro longlife coconut milk for £1, (as do Sainsburys and Morrisons) and Koko dairy free chilled at £2 for 2. Morrisons also have Coconut dream for £1 and appear to sell fresh Alpro coconut milk for £1 all the time (not an offer price! ).